In Blossom, stages are columns that represent your workflow. You can add, edit and remove stages from your Project Board however you please. To add a stage, hover just after or just before a stage and click the [image] plus icon. To edit or remove a stage, hover over the stage and click the [image] cog icon. Work-in-Progress limits are applied to stages to limit the number of features that can be simultaneously worked on. This helps to reduce the cost of context switching and allows the team to focus on the highest value work. When adding or editing a stage, select a value from the “Work in Progress Limit” dropdown. Ideally, for your team you will find a “flow-zone” where the amount of work you undertake and your capacity align. This is what you should set your WIP limit as. You can apply separate WIP limits to your stages (or columns), and this is something that can change over time. Your WIP limits shouldn’t be hard limits. In the end, the point of a WIP limit is to help you get things done, not to stand in your way. If you have a team of four and they are working on ten things at the same time, this means that people are probably working on too many things simultaneously. 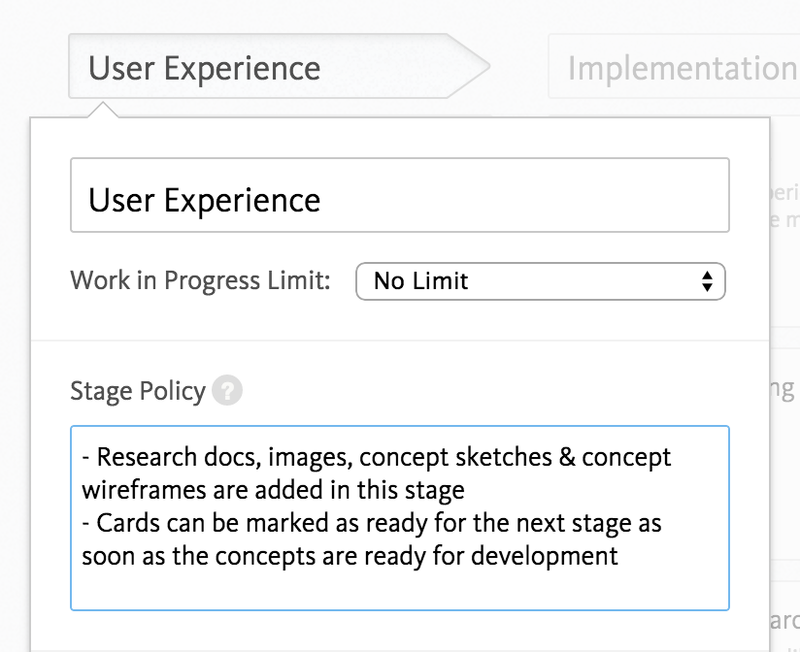 Stage policies allow teams to explicitly define their stages in their workflow. They’re two fold. They describe the stage and they can set the bar for the quality of cards in the stage. Simply hover over a stage and click. You can now define the stage’s policy. The easiest way to start is with the text “Features in this stage…”. Have been developed and tested. Have been distributed across our traction channels. After you’ve described the policy, follow up with some tips/quality descriptions. Set a due date in the company calendar to follow up on feature’s performance. Review work among team before deploying. Closely monitor WIP limit in this stage.